Sammy Nestico was born in 1924 in Pittsburgh, Pennsylvania. He taught himself to play the trombone, and worked as a staff arranger for local radio station WCAE while in high school. Sammy performed with an Army band during the war, and later played with Charlie Barnet, Woody Herman, Gene Krupa and Tommy Dorsey. Sammy is best known today as a top jazz composer and arranger for big band music. He has arranged for the Count Basie Orchestra, the U.S. Air Force Band, the U.S. Marine Band, and has written many arrangements for the television and film industries, as well as writing jazz arrangements for college and high school bands and orchestras for over 50 years. 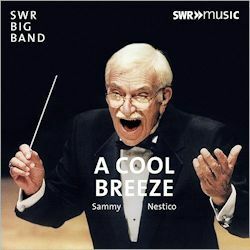 This disc features Sammy’s works performed by the SWR Big Band, an 18-piece band based in Stuttgart. Sammy and the band first recorded together in 2004, and this disc is their fifth collaboration. Six songs on this disc are Sammy originals, the rest are a mix of jazz arrangements of bygone tunes that have been given a fresh look. Moonlight On The Ganges was written by British composer Montague Ewing under the pen name of Sherman Myers, with lyrics by Henry Tilsley and published in 1926. The tune swings with a lovely brass section melody and a fine solo by tenor saxophonist Andreas Maile, adding an interesting snake charmers call to good effect. Close Enough For Love was written by Johnny Mandel, with lyrics by Paul Williams and was the theme song for the 1979 film Agatha. The song is popular among vocalists and has become a jazz standard. Alto saxophonist Klaus Graf plays a slow, sweet solo with pianist Klaus Wagenleiter and the band providing insightful accompaniment. Poor Butterfly is one of the older songs in this collection. Written by Raymond Hubbell, with lyrics by John Golden, it was inspired by Puccini’s opera Madame Butterfly, and was introduced in the 1916 Broadway musical The Big Show. Sammy’s arrangement swings the tune with an easy strutting rhythm and four solos, including trumpeter Claus Reichstaller and trombonist Marc Godfroid. I’ll Follow My Secret Heart was written by Noel Coward for his 1934 musical Conversation Piece. Sammy previously arranged the tune for the United State Air Force band Airmen of Note The beautifully melodic waltz is thoughtfully arranged with several more fine solos, including tenor saxophonist Axel Kuhn, with the full band dynamically filling in and fading out throughout the piece, giving the song a life of its own. One of Sammy’s own compositions is the lovely Softly from My Window, a light, breezy tune with a soft Latin rhythm led by percussionist Guido Joris, featuring jazz flugelhornist Karl Farrent and a brief solo by guitarist Klaus-Peter Schopfer. A favorite song in this set is Sammy’s tune Cell Talk, a bopping, swinging number with the band passing the melody back and forth accompanied and highlighted by an assortment of percussive bells. This music was recorded at U-Musikstudio in Stuttgart in December 2015 and April 2016. Mastering was performed by Tom Kruger, and Hans-Peter Zachary was the producer. The sound quality is excellent. A 12-page booklet is included, with notes in German and English.